It’s always great to see good restaurants evolve and refine their menu as they continue to experiment and take their food to new places. The Peached Tortilla (which happens to be one of my favorite food trucks in town) is no exception, as owner and fellow Atlanta to Austin transplant Eric Silverstein (@peachedtortilla) and chef Lou Cantu (@Lou_PeachedTort) have been getting more and more creative with their fushion / mashup style mobile food. If you haven’t been to the trailer in a while, today’s post shows off some of their newest creations in picture form. I really enjoyed everything pictured below, which were served at a blogger event that I was invited to. While there’s no smell-o-vision or taste-o-vision technology just yet for the Internets, hopefully my words will do these foods some justice. 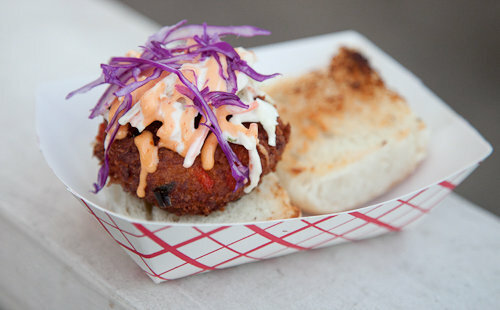 Crab Cake Sliders – delicious crab meat mixed with seasoned breading. I thought these handful sized sliders were great and I was surprised to see them come out of a food truck. You only ever see crabcakes at higher end places or during brunch so it was a welcome change to find this quite large, filling, inexpensive, and tasty slider at the truck. The cole slaw on top was a really nice touch that keeps the slider flavorful the whole time. 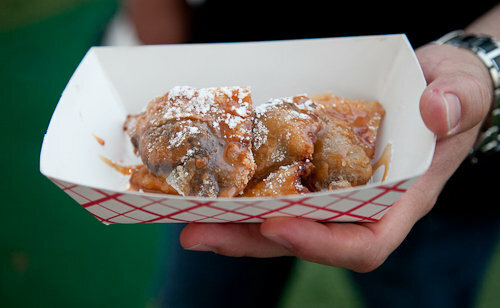 Nutella wontons – these are remeniscent of nutella and banana crepes but better. There is just the right amount of nutella inside (usually crepes have way too much) and everything is better deep fried right? Great for dessert. Unfortunately, these replace the deep fried peaches which they don’t make anymore. 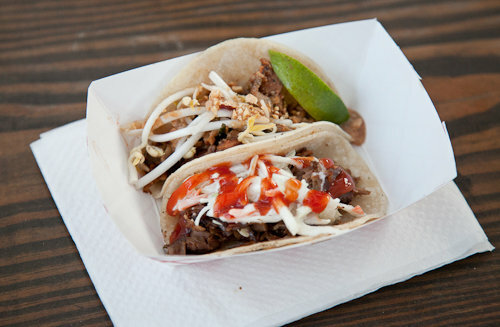 Pad Thai Taco and Brisket taco – First of all you are probably thinking, Pad Thai taco?!? No, there aren’t any noodles in this taco, but instead there is chicken with peanuts, fish oil, bean sprouts, and lime. I’ve never seen this anywhere else and it’s little gems like this that make the Peached Tortilla a cool place to go. This was probably everyone’s favorite of the night. The brisket taco on the bottom is one of their standard favorites and is made up of juicy brisket served with cole slaw and bbq sauce on top. Speaking of standards, if you haven’t ever had their banh mi (pork belly) sliders or fresh fried belgian fries with truffle mayo you are missing out! 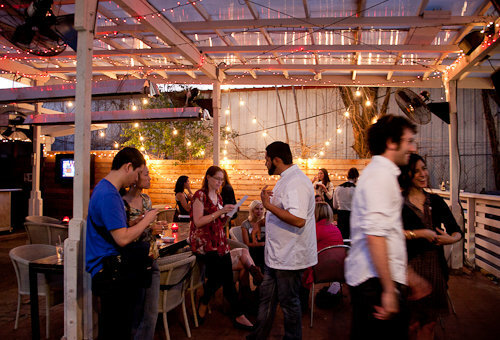 This next photo is of the Star Bar – their usual weekend spot. Don’t take my word for it though, as their plans change from time to time. Head over to The Peached Tortilla website to view the official schedule. Check them out, great food super nice guys following their dreams of bringing awesome food to you. Aww, I miss Star Bar! We’ll have to come visit you to get a taste of all these amazing food trucks in Austin now.